Last month, a former Bellefontaine Neighbors cop, ten-year veteran of the force, officer Joe St. Clair was ordered to carry out a policy that he says required cops to issue a certain number of traffic tickets, and even traffic arrests. If the cops failed to do it, they could be fired. Also, in November of last year. The Free Thought Project reported the story of police in Normal, IL. Several cops from the Normal police department sued the city claiming that the department’s policy forced them to make arrests without probable cause. Only when these department heads are caught in the act of implementing quotas do they deny their existence. Earlier this month, the Free Thought Project was leaked video that shows a Newaygo County Sheriff’s deputy admitting that their department breaks federal and state laws. This cop admitted, on camera, that he routinely breaks federal and state law. He wasn’t blowing the whistle either. He was proposing a grant allocation to the Board of Commissioners and using the fact that he enforces quotas as a sales pitch! When local news departments caught wind of our story, they interviewed the sheriff, who predictably denied the existence of quotas and assured the public that the deputy in the video has faced proper disciplinary action. However, if that deputy wasn’t immediately fired and arrested for breaking the law, then there was nothing “proper” about it. 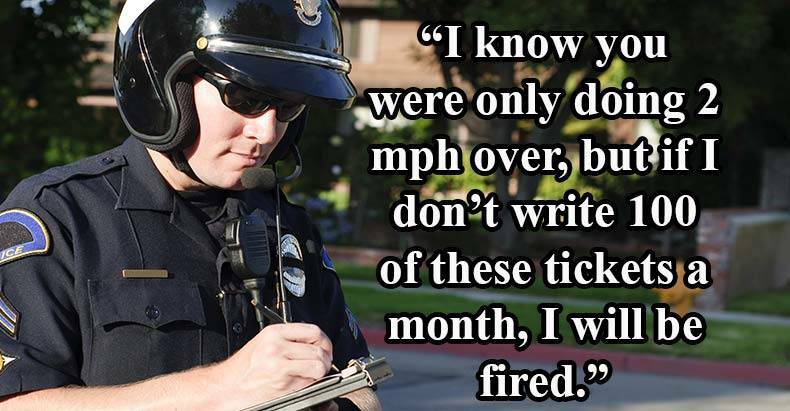 The skewed reality here is that you can mandate that officers enforce illegal ticket quotas, and nothing happens to you. Only when officers refuse to take part in these illegal quota systems, do they become the ones who face any discipline. In America, police can murder unarmed people while being videotaped and face little to no consequences. However, if they point out corruption within their departments, they not only face being fired, but their lives are threatened too. Despite police departments across the country denying the existence of quota systems, the Free Though Project continues to expose them. If you are a police officer or know one who wants to expose department corruption, send us an email at [email protected] Shining light on the darkness is the only way to prevent this corrupt leviathan from reaching unstoppable proportions.